The Los Angeles Philharmonic's new home, Frank Gehry's newest building, the Walt Disney Concert Hall in downtown Los Angeles, finally opened this week after twenty-six years of arguing and odd fund-raising and various disputes. To you European readers it may look a whole lot like his Guggenheim Museum in Bilbao, Spain. Gehry designed this building first, starting with preliminary designs in 1987, but the museum in Spain had an easier time getting from idea to reality, so to speak. When the Guggenheim in Bilbao opened in 1997 the Disney family here, in fact, Walt's widow Lillian, along with some other donors, threw in some serious money, to add to the fifty million that started the project ten years earlier. And, 274 million dollars later, they got this building done. The two buildings have a lot in common. These are jumbled masses of "organic forms" wrapped in shiny, windowless metal panels. The Guggenheim Museum in Bilbao is wrapped in titanium. Here the façade was originally going to be limestone, but that was too expensive, or would not do at all with the earthquakes we sometimes have out here, so we get brushed stainless steel. The initial reviews says it sounds just fine - a Japanese acoustician named Yasuhisa Toyota worked with Gehry and, from what I've been reading, it's an excellent, warm, "live" hall. So here's what it looks like, but all the art and architecture magazines have other pictures, and cutaways and floor plans. National Public Radio did a segment a few days ago on the French 3-D CAD-CAM software the builders used. The Christian Science Monitor said, "It looks like an exploding metal artichoke." The New York Times' Herbert Muschamp said it was "a moon palace" bathed in "the light of the Hollywood dream." I don't know. It's just a pretty cool building. Gehry is seventy-four. He's lived out here for sixty years. I'm sure he's smiling. See the footnote at the bottom of the page for further comment from various critics. Who ever said the very rich don't have a sense of humor. 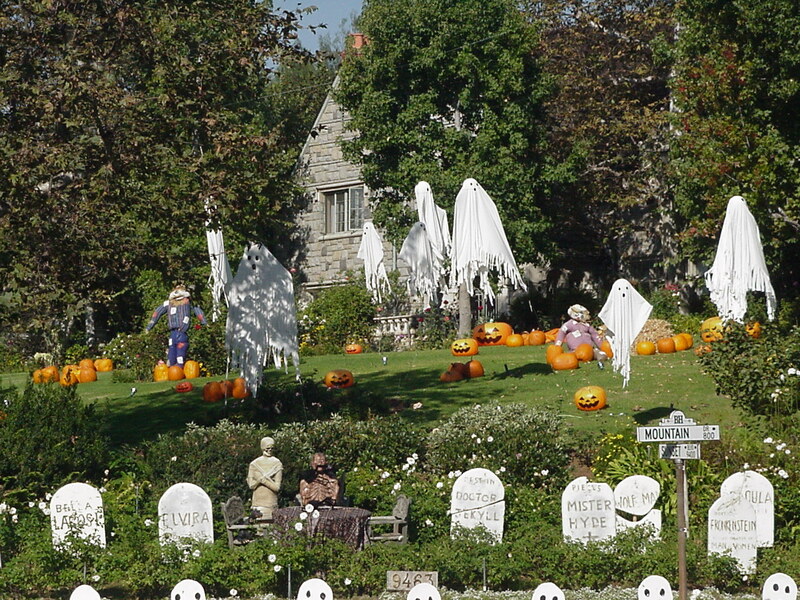 One mansion, at the corner of Sunset Boulevard and Mountain, right in the heart of Beverly Hills, has this Halloween display, along with new Rolls and steel-gray Ferrari in the driveway. Had I children of the appropriate age I might send them here to ring the bell and see what gets dropped in their bags - a Snickers bar or a new Rolex? 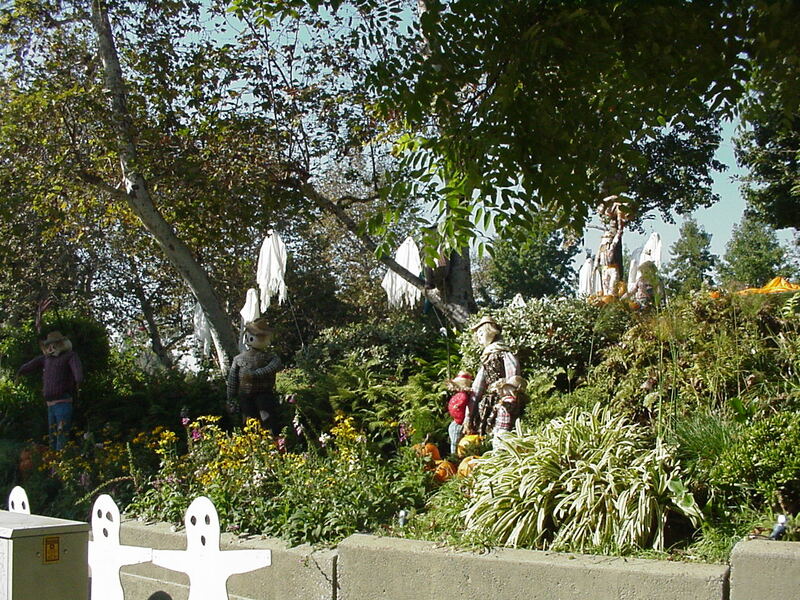 But I doubt the trick-or-treaters will visit here. Such places have very good security - mean looking men and even meaner looking dogs. 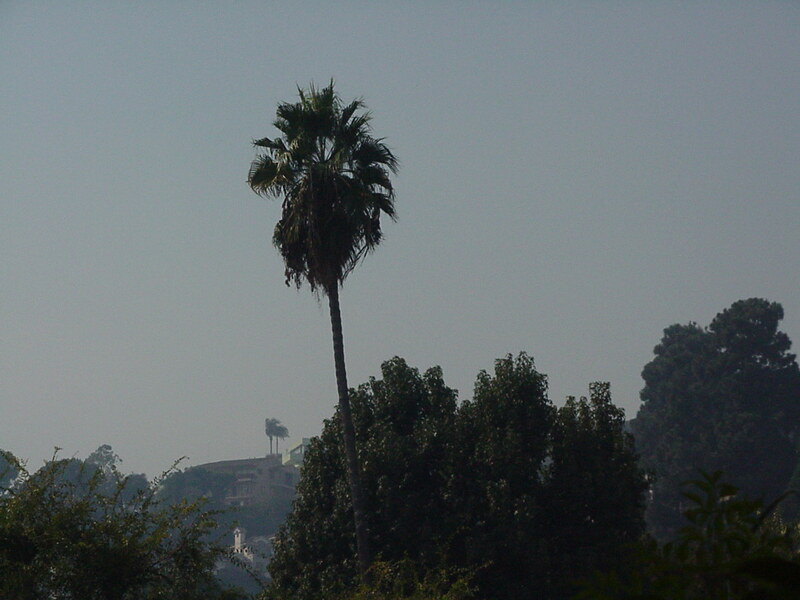 Palms in the Hollywood Hills as seen from the balcony Sunday afternoon, in the hazy smoke from the fires burning all around the edges of Los Angeles. Fifty thousand acres of brush on fire in the distant hills, but nice diffused light here in the city. From last week's home page, Windsor, just off Sixth in the Wilshire district. 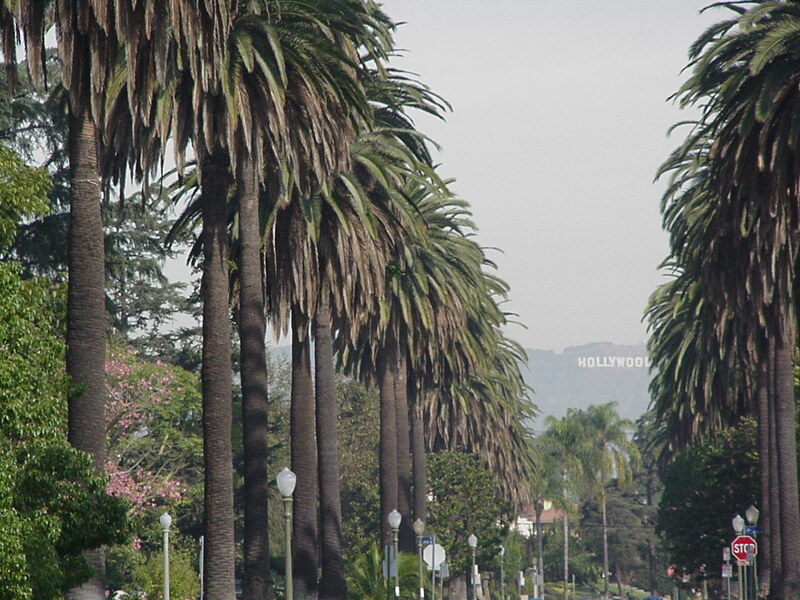 A street lined with palm trees framing the Hollywood sign in the distance. Sunday morning. No one about but a few kids on skateboards. 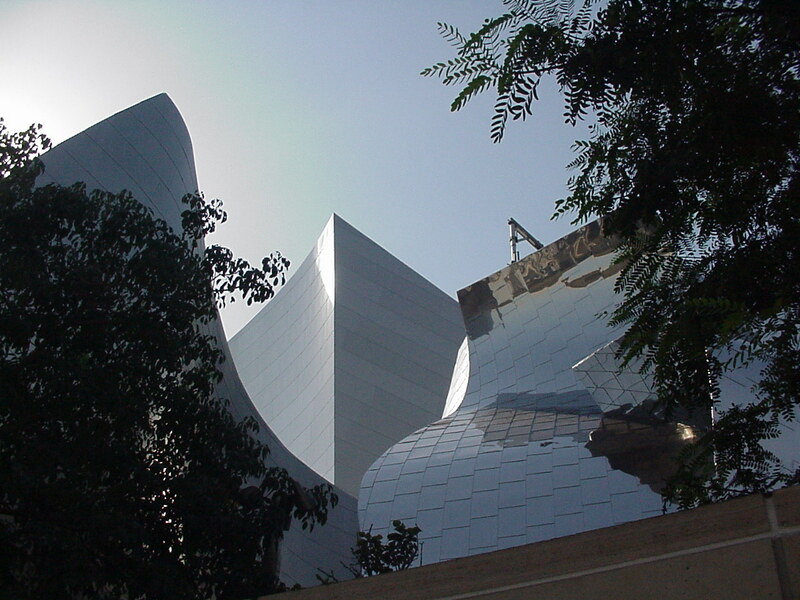 "The Disney Hall has been likened to a silver galleon with full sails billowing in the wind. Its abstract shapes provide a brilliant contrast to the conventional high-rise towers of downtown L.A."
"Its silvery cascades are one of the most beautiful sights anywhere in the U.S. If you have seen the Grand Canyon, another sun-drenched, curvy thing of hypnotic power, you have some idea of what Disney Hall is like.... Gehry's design thoroughly digests the Western architectural vocabulary without quoting literally from it. The free-form silhouette is just right for a concert hall in multiethnic Los Angeles, a city that doesn't look to Europe for much beyond designer shoes.... What he did was a classical hall for an anticlassical city. In Bilbao, his curves make you think of the Spanish baroque. In L.A., they bring to mind all those magic wands in Disney sketching silver arcs in the air." "Though the Bilbao museum is undeniably a work of genius, Disney Hall is more mature, more focused, more polished, and more thoroughly resolved as a single experience; and it is better executed in its details. Everything in this rich and complex orchestration of surface and volume, light and shadow, comes together with an assurance and authority that I found astounding.... [Gehry] can now, in my view, be counted safely among the most talented builders of the ages, comparable to the great impresarios of inventive architectural form." 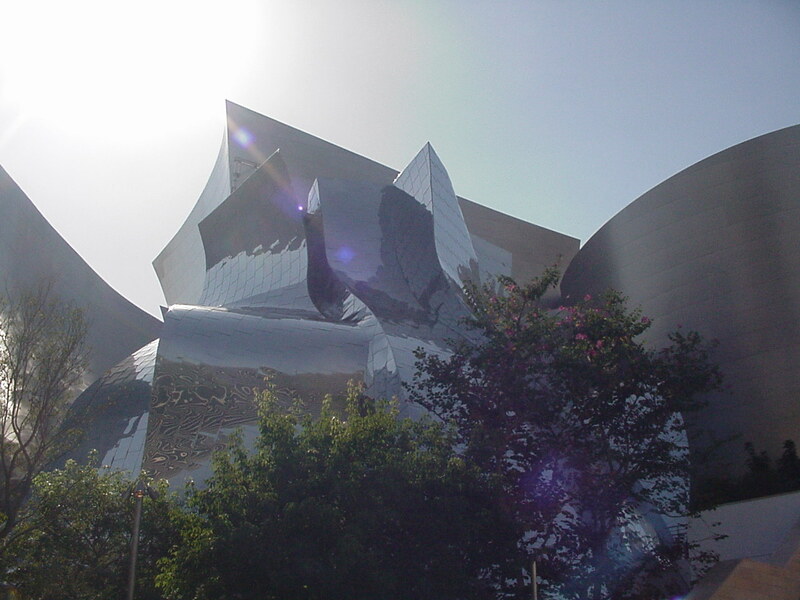 "Disney Hall is a defining masterwork - because of [Gehry's] love for music, for Los Angeles and for his art. Its roller-coaster swoops and gleaming curves seem to mirror his formidable energies and ambitions." "The technique is Cubist. No seamless image reveals the whole. Disney Hall must be assembled within the mind piece by piece as you approach and walk around it. A Surrealist ethos also suffuses the design: the imagineering impulse of Disney as well as of Magritte. Pumpkin into carriage, cabbage into concert hall, bippidi-bobbidi-boo.... Metamorphosis happens, and not only in Walt Disney's classic films. Cities do it all the time. Los Angeles has done it now. The building pulls together the strands of many individual stories and creates an extraordinarily gallant setting in which they can be screened." "The chief amenity, if it can be called that, is its almost spellbinding beauty. Gehry's is an art of built-in surprises. He desires the surprise of the immediate 'Wow!' And he strives for the delight of longer contemplation. Disney Hall provides both. So, do not be deceived by the beautiful photographs, for as splendid as they can be, they always tend to mask the immense variety of spaces, surfaces and light of the real thing." "The outside of Disney Hall lifts the spirits of those who see it from the sidewalk or, this being Los Angeles, from the windows of their cars, and the inside is equally inspiring. The auditorium is the finest interior Gehry has ever made.... It may be that restaurants, stores, and housing will rise up around Disney Hall and transform the neighborhood into the urban mecca that so many people seek, but I wouldn't bet on it, and it doesn't matter. 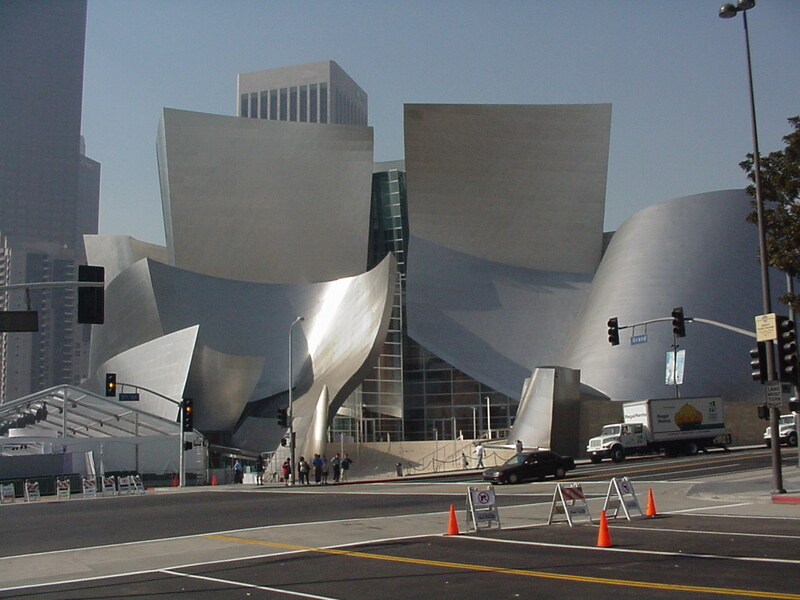 Disney Hall is something rarer than a great urban street. It is a serene, ennobling building that will give people in this city of private places a new sense of the pleasures of public space."